Ever thought of how you would propose to your girl? I, personally, haven’t gotten far beyond the let’s-IM-on-MSN-and-I’ll-propose-her-there idea: it’s dead simple, free and for us geeks (most of us, anyway) with little to no social skills: exceedingly effective. Chad and girlfriend Vy (Why or Wii?) went out for a movie to a theatre on their first date. That theatre, of course, holds a great amount of sentimental value to both of them. 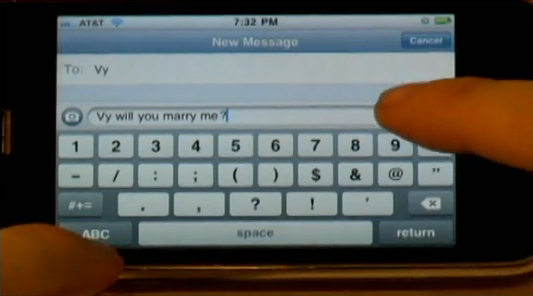 So Mr. Chad decided to film an iPhone commercial which eventually leads to him typing the magic will-you-marry-me words. The video looks like a commercial but it isn’t. And entire magic comes from the surprise Vy and the other movie-watchers get when they realize that this is an actual proposal! I proposed to my girlfriend by creating a mock iPhone commercial and having that commercial play on the big screen in the Movie Theater. She was completely surprised once she figured out what was playing on the screen wasn’t actually an iPhone commercial. I used a ton of apps in the making of the video such as: Google Earth, Skywriter, 3D Drum Kit, NLogFree, Animoto and others. Vy, of course, agreed to marry Chad. Who wouldn’t, after watching this video! This Chocolate Covered iPad Idea Can Make You the Best Boyfriend / Husband Ever ! You can follow us on twitter or join our facebook fanpage to keep yourself updated on all the latest Microsoft, Google and Apple.